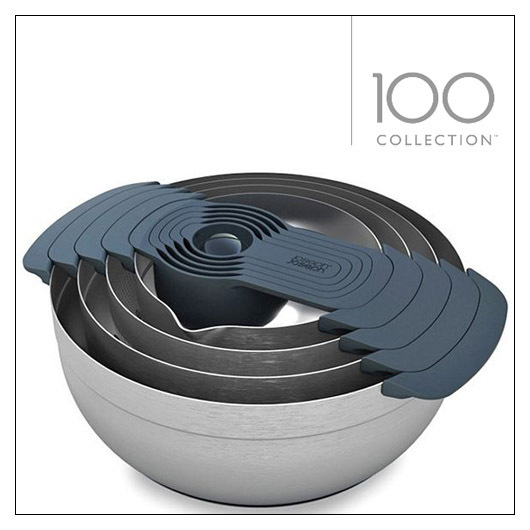 Nest 100 Compact Food Preparation Set (JJNEST100) at Pure Design / Accessories / Kitchen ::: Furniture for the Home, Office, Home Office, and More at Pure Design Online! A 9-piece food preparation set with an innovative space-saving design, that allows the individual elements within the set to be stacked together. The set includes two sizes of stainless-steel mixing bowl with non-slip bases; a stainless-steel sieve; a large stainless-steel colander; and a set of five measuring cups.